Before social media, options for information receiving in order to be a more civically engaged person were limited. You could subscribe to certain newspapers or watch certain channels, but ultimately your options for receiving news were from well-established institutions that all meet the same type of standards. Sure, the New York Times might have a different perspective than Fox News, but largely the information you were getting would have gone through a type of “criteria-filter” and, regardless of any bias, the information would all be relatively similar. And, arguably the most important factor of all, these mainstream institutions relied, above all else, on their reputations for fierce and accurate reporting. After all, these institutions carried a great responsibility: providing the most vital national and international information to every single person that wanted it. With reliance on mainstream institutions that were forced to maintain a certain level of credibility in order to stay relevant, there was no “Daily Me,” or some intensely curated experience, as MIT technology specialist Nicholas Negroponte coined. Negroponte predicted that, eventually, people would no longer be required to read a newspaper or visit a news channel to receive information necessary to civic engagement. Instead, you would have some sort of application or program, “Daily Me,” that would hyper-focus on whatever you wanted to know about. You could create an echo chamber on topics only you care about while simultaneously shutting out all conflicting information. This wouldn’t come until the creation of algorithms used by social media platforms to curate each of its users’ experience. The effect of the introduction of social media can be seen in how the level of trust in these mainstream news institutions has shifted over the past few decades. Since the 70s when Gallup started following this, trust in mass media peaked in the mid-70s at 72%. By the 80s, trust in mass media continued on a steady decline until around the turn of the century, when the trend jaggedly cruised to a record-low 32% in 2016. Interestingly enough, we really only started to see trust in mass media dip below 50% at the same time that Facebook was introduced in 2004 and Twitter in 2006. Since then, a majority of Americans lacking trust in mass media has been the new norm, year after year. As explained in the previous subtopic, news consumption prior to social media was very homogenous. Independent news couldn’t garner attention prior to the internet, and people simply trusted what could be delivered to their homes or displayed on their TV screens. This, of course, meant mainstream news was the only viable option for the vast majority of civically engaged people. However, in the past decade-and-a-half, or so, news consumption has taken on a whole new image. Studies consistently show a majority of Americans are turning to online sources of news information, particularly young adults. Even studies as old as 2011 show as much as “65% of young adults turned to the internet as their primary news source” (Antunovic, Parsons, & Cooke, 2018). Basically, the results are in: mainstream, traditional news intuitions are now not only sharing the role of information gatherers and publishers but are actually taking a back-seat role, as social media and the internet as a whole has become the most common way people—particularly young people—stay civically engaged. It’s also important to understand why this is happening. According to Gordon, Baldwin-Philippi, and Balestra’s 2013 Harvard University piece on why we engage and our understanding of civic engagement in a digital era, they pinpoint three main reasons for why the evolution of civic engagement occurs, all of which are “valuable or necessary for participation in public life.” First, they say we must have the ability to “acquire and process information relevant to formulating opinions about civic matters.” Second, we must be able to “voice and debate opinions and beliefs related to civic life.” And finally, we must be able to “take action in concert and/or tension with social institutions.” In other words, we migrate to social media and prioritize it over mainstream media because it makes all of these factors of our civic engagement easier and more effective. Ultimately, social media empowers and curates our civic engagement experience, and that’s why it has taken such a pivotal role for news consumption in the last quarter-century. As I discussed a little bit earlier in my topic on trust in traditional news media before Twitter, the digital age has not been kind to the traditional news media’s reputation. People haven’t flocked to social media for becoming more civically engaged solely for efficiency. In this partisan age where fake news flourishes, people simply no longer trust traditional news to be honest with them. In a recent poll, 72% of Americans say traditional outlets “report news they know to be fake, false, or purposefully misleading.” Among Republicans and Republican-leaning independents, the number was as high as 92%. This very anti-mainstream media and pro-online news source sentiment is commonplace in CNN YouTube comment sections. 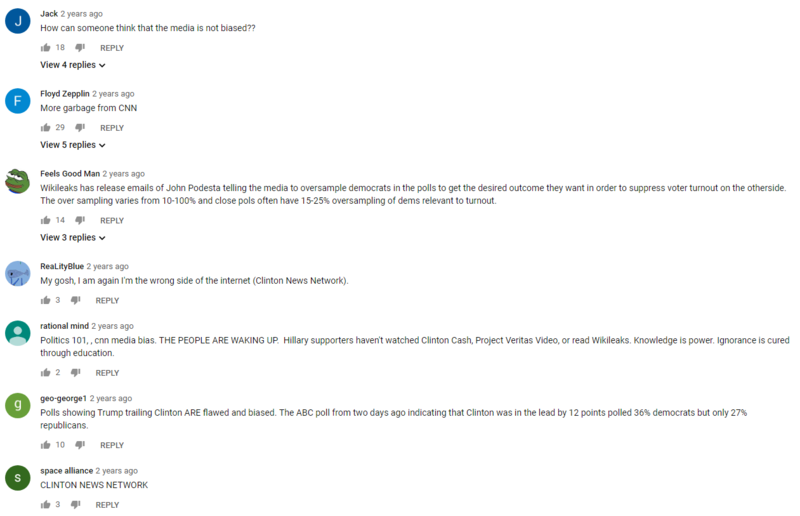 This is a direct screenshot from a CNN video's comment section on the supposed innacuracy of polling running up to the 2016 US presidential election. One of the major reasons I think this is happening is because of a lack of significant and information-heavy analysis in modern mainstream media coverage of politics. Particularly in elections, mainstream media has succumb to covering the partisan bickering and cheap shots that politicians oftentimes involve themselves with. If the American public hates when their politicians do this, they certainly hate it when the media does it. It makes the media look petty and useless, and gets them accused of “offering little to citizens in the way of useful information and in-depth analysis concerning public affairs” (Pinkleton & Austin, 2002). Meanwhile, the in-depth analysis, data, and in-the-weeds intellectuals have moved to Twitter to tell the people what’s really going on. There is no filter, no protocol, no soundbite; only raw, no-nonsense information that can be told directly to the people that want it. Increasingly, people appreciate this kind of thing over the filtered and structured seen in traditional news. Obviously, it’s okay to want to get your information from places other than traditional news. If you’d rather go directly to a politician and social media makes that easier for you, then go for it. There is actually plenty of great information you can get in blogs and social media and directly from politicians that you won’t get to such great detail on traditional news. The problem is, you have to be critical, open-minded, and you have to know what to look for. When gathering news on social media, you have become the journalist. It is your responsibility to sift through and find the most accurate information. 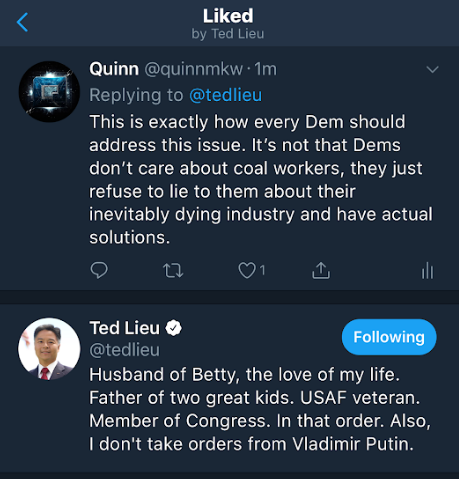 This is a Twitter screenshot of a politician I follow and respect 'liking' my own tweet. This means a US Congressman with nearly one million followers not only read my message to him, but showed that he liked and agreed with it. This is something mainstream media will never be able to offer. The problem is that most people that go to social media for their news are “news illiterate,” or they simply don’t know how the news operates and are less likely to search for credibility cues when seeking out news. This means that many of the people who go to social media for their news will not be able to distinguish fake news from real news, and the people that have the news literacy to distinguish these things normally get their news from other sources, such as newspapers. There is good news, however. The evolution of our news gathering practices is a teachable moment for everyone. With the experiences we gain in using social media and seeing fake news first-hand, we are all having a conversation about its dangers and how to avoid it. With experience comes knowledge. In the digital age, our media literacy is not only evolving, but it’s become more advanced. “Advancing media literacy can help people understand these threats and better evaluate information and sources” (Lee, 2018). In other words, our ability to not only spot fake news but to navigate civic discussion and news consumption in the digital age will only continue to get better. Civic engagement in the digital age is convenient. I have a Twitter account just for receiving political information and following political leaders because I find it is the most effective way I can get political and world information in the fastest way possible. But what I find is that my reliance on traditional news hasn’t gone away with this practice that I have. I still follow traditional news on social media such as the New York Times, CNN, and MSNBC. I still follow popular journalists such as Jake Tapper or Rachel Maddow. In fact, I still watch traditional news, though I do it through their official YouTube channels. My point is, traditional news has made efforts to blend with the digital age. It is no longer about whether to use Twitter for your news or CNN. You can do both at the same time. Of course, there are less traditional options online as well. But the reliability and reputations of well-established institutions like the New York Times aren’t something to scoff at; those institutions are tools that everyone should make use of in their quest to become a more civically engaged person, on or offline. Sunstein, C. R. (2017). #Republic: Divided Democracy in the Age of Social Media . New Jersey , NJ : Princeton University Press.